MEMORIAL DAY WEEKEND was fast approaching. Living in a new city—no family here, no circle of friends yet—meant it was shaping up to be a boring, lonesome weekend if we didn’t think fast. That’s when Brian remembered we’re less than four hours drive from Niagara Falls. The inside scoop from various people—that the Falls on the American side are crass and commercialized—prompted the noble goal of venturing beyond Niagara and the usual tourist traps. Searching for magic on bbcanada.com resulted in a cozy room at Bonnybank Bed & Breakfast in Vineland, Ontario, 20 minutes west of the city of St. Catherine’s. Exploring the Twenty Valley became our main focus (see Related Posts for Twenty Valley articles) and we did the Falls on the Canadian side on our way back to Ohio. Visiting Niagara is one of those copycat things—like Disneyland—that everybody does. Commercialized? Absolutely. Tacky food, souvenirs and photo ops? You betcha. Canadian side not excluded. But never mind that. Mother Nature expressing herself with such beauty and force is unforgettable, even when crowded by diet soda guzzlers. The sheer volume of water crashing over the falls is mesmerizing. I couldn’t get enough of it. When not obsessively attempting to frame the Falls in the ultimate photo, there’s plenty of adventure to be had. A flotilla of busy boats, all christened Maid of the Mist, will take you as close as you can safely get to Horseshoe Falls by water. The Journey Behind the Falls, the White Water Walk and the Whirlpool Aero Car allow you to experience the Falls from behind, next to and above. Across the street from the Falls is a statue of Nikola Tesla, the genius inventor who discovered AC current. The real father of electricity, Tesla’s becoming better known these days. But he still does not share the level of fame enjoyed by Thomas Edison, the man who discovered DC current—which, incidentally, did not prove to be economical for our massive populations. Another visual fascination was our fellow tourists. The variety of ethnicity, clothing style and language was bewitching. 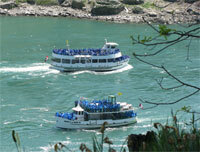 Until you visit Niagara for yourself you cannot grasp how much this truly is a world destination. Time was limited; with our precious remaining hour we opted to ride the elevator to the viewing deck of Skylon Tower. The view from up top was phenomenal. 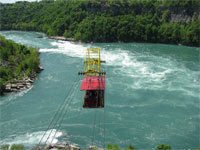 If you’re planning a trip to the Canadian side, check out the Niagara Falls Great Gorge Adventure Pass. This gives you even more than I’ve been able to mention here. Spontaneity was our theme for that weekend, but advance planning is vital if you want to do it all. Yep. Should be on everyone’s. 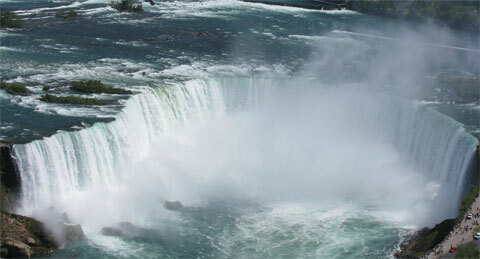 The volume of water crashing over Horseshoe Falls is mesmerizing. Brian took this shot from the viewing deck of Skylon Tower. In the words of Lois, WOW; you did a great job on the site. As so many have done, we spent a few days of our honeymoon (many moons ago) at the falls. There is simply something magical that draws you back again and again; a sight I have never tired of. Good luck with the site, and I’ll be watching your travels. I just got back from Niagara and we had a great time! I came across your article when I was doing research before the trip and it was really helpful. I got the Adventure Pass that you mention here and it was the perfect deal for us- just enough sites without getting bored. This is GREAT! I’ve heard that the Canadian side is nicer as well….however on MY bucket list – I want to stay in a pink hotel room with a round bed AT Niagara….do you think they have any of them any more? LOL! I think if I found a lovely bed and breakfast, I guess I could compromise, but I always thought that would be the height of fun! LOL! A pink hotel room with a round bed. I didn’t see any of those! There are lots of hotels lining the cliffside that overlook the Falls and I’d love to stay at one of those sometime (but only on the side with the view). But otherwise I’m a B&B girl. We stayed in a B&B in the Twenty Valley, which is wine country and also has some great restaurants. The Twenty Valley is only a short drive from the Falls on the Canadian side and I think you would really like it there.